Just in time for whatever gift-giving occasion is right around the corner, Every Doggie Has Its Daycare is now offering gift certificates! 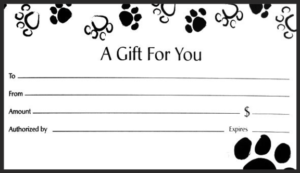 Available at our location, these gift certificates highlight the fact that you’re not just buying a gift for a human. You’re also providing an amazing experience for their dog. Owners get to spend a night out on the town or just drop the dog off for a full day of play. And the dog, well, he gets to run around all cage-free and social with his buddies. It’s a perfect way to show both dog and owner that you care about them. And these gift certificates come in any denomination. Just let us know what you’d like to spend, and the lucky recipient – whose name might just be “Lucky” – can put it toward any of our daycare or boarding services.